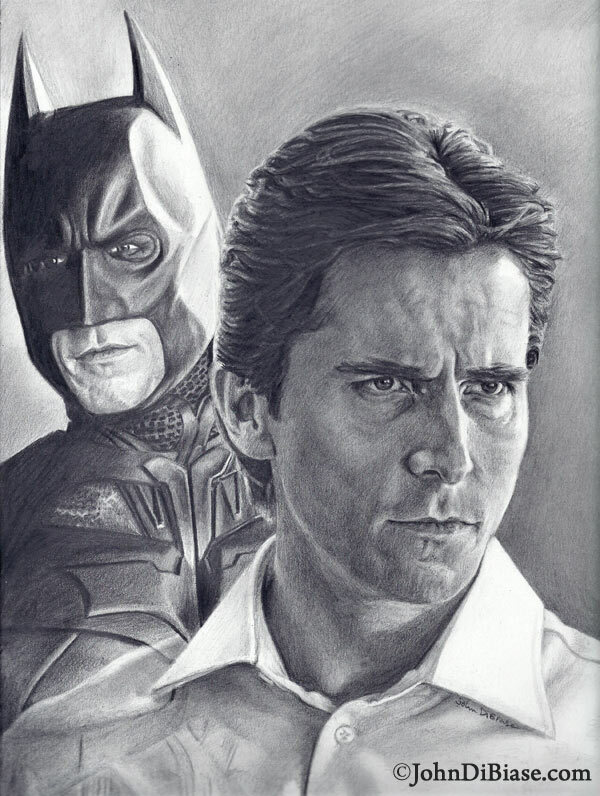 In July, 2012, I felt inspired by the new film The Dark Knight Rises to work on a Batman portrait. I’d actually worked on this before seeing it, and revisited the previous two films in the process. While working on it, I knew I’d wanted to have Batman and Bruce Wayne together — much like the Hulk/Banner drawing — and wasn’t quite sure how I’d accomplish that. Up until near the finish of the drawing, I’d had it where Batman blended into Bruce’s shoulder, hinting that they are one in the same. The problem was that the collar on Bruce was on top of Batman and so the perspective was out of whack. I decided to erase into Batman the design of Bruce’s shoulder and erased a bunch of detail I’d put into it. I then proceeded to fill in extra detail and ghost in Batman through Bruce’s shoulder. I actually really like the final outcome! It was all done with regular drawing pencils.